We process ejectments as fast as possible under state law. If you have an unwanted individual living in your property, and no landlord-tenant relationship exists, you may need to file an ejectment. The City of Philadelphia prohibits removal of persons without due process. Accordingly, the best way to remove an unwanted individual from a property you own is through ejectment. Ejectments are governed by the Pennsylvania Rules of Civil Procedure and litigated in the Philadelphia Court of Common Pleas. Accordingly, a layperson filing an ejectment alone is at a disadvantage. An ejectment usually takes between four and seven months from start to finish. There are three main stages to an ejectment. 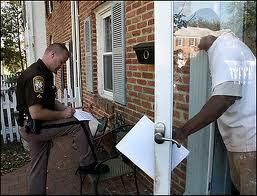 First, the owner must file and serve a civil complaint on the tenant. Following service the owner or his attorney must attend a case management conference and obtain a trial date. At trial the owner must establish a superior title or right to possession of the property. Finally, after obtaining a judgment of possession from the court, the owner or his attorney must schedule a lockout with the Office of the Sheriff of Philadelphia. The total approximate cost of an ejectment is $725.00 before attorneys fees. We are committed to reclaiming your property as fast as possible. You simply provide our office with the deed to the property. From there we file the civil action, serve the squatter, and appear at the case management conference for you. While your presence may be required at the trial, we streamline the matter so that your role is very limited. Speak with Mark Copoulos about alternatives to ejectments such as executing a settlement and release agreement with the squatter. In some situations negotiations make sense. Retaining our firm for an ejectment ensures you will reclaim your property as fast as possible under Pennsylvania state law.